The light-duty Silverado 1500 is GM’s perennial best-seller but while the sales of the best-selling F-150 have grown for few percent in last model year, Chevy’s full-size pickup sold in fewer units. In order to keep the pace with recently refreshed F-150, Chevrolet is working on the new version of its light-duty truck which will arrive in 2018 as the 2019 Chevy Silverado 1500. 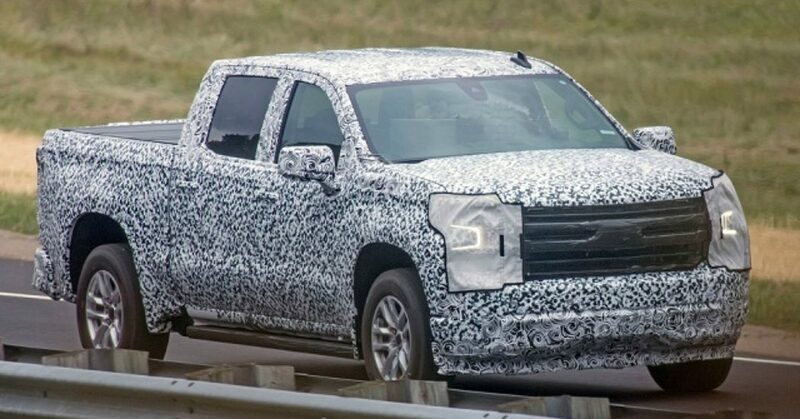 A heavily camouflaged prototype of new-generation Silverado was spotted while testing in the form which suggests it is near production-ready phase. It’s mechanical twin, the GMC Sierra has also been in the testing phase and should arrive a bit later than new Silverado. Chevrolet still hides important details about the redesigned Silverado and more we will now closer to its debut which is expected in early 2018. What we should expect are improvements on all fronts. The model will undergo structural upgrades and should also improve its power and towing capabilities. The styling will be an evolution of the current form and the new version will gain upgraded tech and safety features. Overall, the new Silverado will experience extensive update rather than full redesign. The current generation of the Silverado which arrived in 2014 sits on GM’s K2XX platform designed for the full-size trucks and SUVs. The new 2019 Chevy Silverado 1500 will gain new chassis and upgraded suspension but will retain body-on-frame design including also the live rear axle and leaf springs. The structural improvements will improve model’s capabilities plus it could shed some of its weight by using an aluminum is some body elements. However, Chevy hasn’t confirmed it would use aluminum in the new truck. Styling wise, the new Silverado won’t also stray far from the current form. Judging by the spy photos, the model will keep its horizontally oriented design but will make some changes front and rear. Frist to notice will be changes on model’s front end. The new Silverado will get new headlights with new and attractive LED accents. The front bumper will also look different and the rear will also receive similar treatment plus a pair of prominent exhaust pipes. Interior of the model will also change but not radically. Spy photos of interior reveal similar design of the dash although with larger center screen and prominent controls below it. Chevy’s latest MyLink interface will be available on all versions and the model will again come in many trim options and three body styles. The active safety technology is already present on this truck but for the new-generation version, more systems should be accessible in lower trims. As for the engine options of the 2019 Chevy Silverado 1500, we still don’t know what Chevy has on the mind. We expect upgraded versions of the V-6 and V-8 engines should provide more power and torque and therefore better towing capacities as well. The new 10-speed automatic transmission should also be in the combination and also improve performance and efficiency. In response to the diesel engine on the refreshed F-150, the oil burner is also a high possibility on the new light-duty Silverado. What we also have in mind as the possibility, is the high-performance Silverado version based on the Silverado concept from the 2017 SEMA show to make completion with Ford’s Raptor model. Like most of the details, Chevy successfully hides the release date of the new 2019 Chevy Silverado 1500. The model will likely make the debut at the 2018 Detroit Show. The sales should start in summer 2018. The price will also stay close to the current range and could again start below $30k.